Improve Your Playing and Performing Fast! This is the first of its kind audio course developed specifically for musicians. 7 CD Audio course teaches musicians about self-confidence and mental toughness. Imagine if these lessons could be absorbed by you, just by relaxing, sitting back, and listening as each story unfolds. These lessons can be listened to over and over again, each time revealing a new revelation. This step-by-step, audio instruction course contains everything you”ll need to really make a change in your playing and performing from the Inside-out. Easy 6-Stage process makes it fun and easy to master the mental skills techniques. Only the pure joy of entertainment. After listening to the CD lesson, I started to get it. It was so easy; I just sat back and listened. Every section has interesting real life musician stories with powerful lessons in each one. It is an easy and quick way to learn. The lessons just made sense. Everyday I would listen to the same CD in my car for a week. Right away I started to feel different; I noticed the messages were sinking in. I started to feel more focused when practicing. The music started coming to me easier, I wasn’t struggling like before. I love this CD course. When I listened to this CD course, I felt something good. I could relate to what the characters were going through, especially not feeling good enough. It helped me by giving me new ideas to start improving my self confidence. If you are serious about becoming a better musician then this is the most important CD audio course you can buy. This course taught me mental techniques I used to ramp up my Motivation. The mental skills really helped me improve communicating with my band. I now feel more confident in everything I do. I highly recommend this product, it is great. Recognize and refuse to listen to those negative outside sources who would bring you down. Step-by-Step you are guided through the process of handling all playing situations with ease and confidence. Imagine playing on stage and not worrying about how you are going to play, or what others think of you. 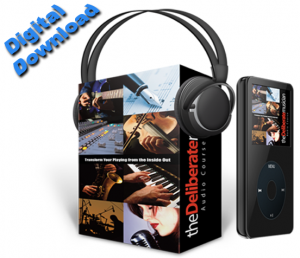 Upon placing your order using our secure server, The Deliberate Musician 7 CD course will be immediately shipped to your door. The course contains over 7 hours of Mental Skills training. Our 6-Stage process teach you Everything You Need to Improve Your Playing and Performing Fast! It’s So Easy; just put the CD in your PC or CD player, then sit back and relax as you listen to each section. Every section has three parts: An Introduction, a REAL LIFE story of how a musician client of ours overcame a problem or issue using our system. And last you are guided step-by-step through the 6-Stage process. Nothing is left out, everything is explained clearly in easy to understand terms. “These practical music lessons on self confidence, focus, listening to the other band members are timeless. As you listen to the CD’s over and over, new information is absorbed quickly. CD 2 – Outside Forces: What are the outside forces that are influencing how you see yourself as a person and as a musician? You will discover all of the tools and techniques you need to change your life. No more fear, doubt and worry only confidence and power. CD 4 – Inspiration and Motivation: Step-by-Step we teach you how to unlock the hidden power of your mind, to discover the best songwriting ideas, melodies, and harmonies. We will reveal to you how to become inspired before taking action in your writing and composing. Apply our Deliberate process to move easily past Blocks and Plateaus. Learn simple but powerful techniques to quickly ramp up your Motivation. CD 5 – Recording: You start by applying our proven 6 Stage process to recording situations. Working from the inside-out you’ll be exposed to the key mental aspects you should be thinking about before you start to record. Using our “Music Target Declaration” you will map out everything just the way you want it to happen. Next you will learn to fine tune and improve your plan before you start to record. Saving you time and money. CD 6 – Teaching Music: Learn the mental skills processes needed to build a prosperous music teaching business. “Path to Clarity” and “Music Target Grids” will help you quickly identify exactly what kind of a teacher you want to be, how will you teach, who will you teach, how often, and what level of student. Apply power visualization techniques to change your negative thinking to positive. This lesson also covers how to stop self-limiting thinking patterns you have about your playing and performing. CD 7 – Music Student In College: If you are a college music major or plan on attending college, these lessons are for you. We explore the many aspect of being a college music major. What kind of schools to choose, and suggestions on how to find the money to get there. What type of practice you should be doing, and how to interact with teachers. How to manage the pressures of Auditions and Performances easily using our powerful techniques to create the experience you want. As you apply our proven 6 Stage process, you dramatically improve your grades and performances. Thank you so very much for spending the time reading about “The Deliberate Musician 7 CD Audio Course.” We had a great time creating the audio course, and are excited to share it with you. While we were working on the course we created some extra tools to speed up your progress, and we would like to give them to you as a bonus. I Know What You May Be Thinking…Can I Do This? And let me tell you… YES – YOU CAN DO THIS! 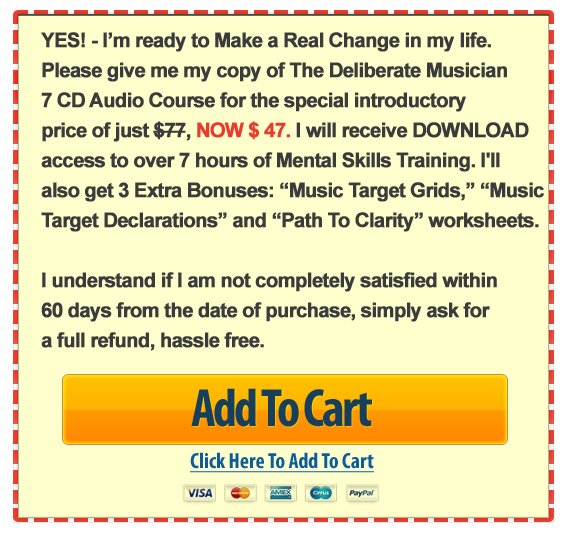 Bonus #2 – “Music Target Declaration” A Music Target Declaration is a powerful tool to overcome our negative beliefs in our conscious and subconscious mind. Using the Music Target Declaration will help you think positively, keep you on track with your goals and helps to eliminate old negative feedback. You absorb the concepts just by listening as each story unfolds. 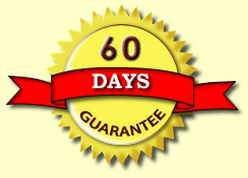 You have a full 60 Days to “Try” The Deliberate Musician Audio Course. If at any time you are not completely satisfied, simply return the product for a full and prompt refund, no questions asked. 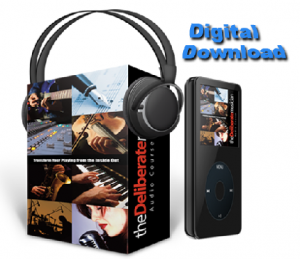 Let me recap – get The Deliberate Musician Audio Course. At anytime in the next 60 days, if you are not 100% Satisfied, just send us the CD’s back, and we will refund you your purchase. How’s that? YES! I’m ready to Make a Real Change in my playing and performing, How Much Does It Cost To Get Started? $77 NOW $47 (33% OFF)! And to take all the risk out on your part, I am offering all this with a Hassle Free 60 Day Money Back Guarantee!